The Countryside Fire Protection District is sponsoring a Middle School Variety Show Contest focusing on Fire Safety & Burn Prevention. Fire Prevention Week is designed to provide an opportunity for fire and life safety educators to unite in sharing fire safety awareness and prevention messages in our communities. Contest is open to 8th grade middles school groups at Freemont, Hawthorn North, Hawthorn South, West Oak, and Woodlawn. Students must be in 8th grade. 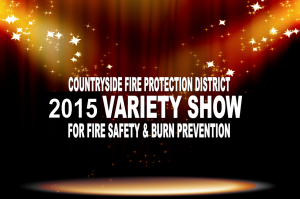 The skit should be between 1 1/2 – 2 minutes long exploring fire safety/burn prevention topics. We highly encourage skits, songs, dances, etc. Be CREATIVE and IMAGINATIVE for this show! Material and performances should be safe, educational, informational and appropriate for middle school. Students must present at least three (3) informative and accurate facts about topic (try to stay with one fire safety topic). All students in the team must participate at some level. Performances to take place live on stage. There can be no actual fire. All props and materials to be approved by Fireman Tony Rodkey. Registration form must be completed by each team. For a copy of the Variety Show Rubric, click here. Students are strongly encouraged to visit the following websites for more fire safety topics and informative facts. They are as follows: National Fire Protection Association (www.nfpa.org), Campus Firewatch (www.campus-firewatch.com), and Firesafety.gov for kids. Hawthorn Middle South – Friday, March 27, 2015 at 1:30 p.m.
Hawthorn Middle North – Friday, April 10, 2015 at 1:30 p.m.
Woodlawn Middle – Friday, April 17, 2015 at 1:30 p.m. The top teams will then move on to the Grand Finale Variety Show scheduled for Friday, May 8th at 7 p.m. (doors open at 6 p.m.) at the Vernon Hills Park District – Sullivan Center located at 635 Aspen Drive, Vernon Hills, IL. The event is free of charge to all patrons. Grand Prize – $500.00 in American Express cards and a Buffalo Wild Wings party. Second Place Team – $400.00 in American Express Cards and a Cold Stone Creamery party. Third Place Team – $300.00 and a Wendy’s party. NOTE: There will be an assembly at participating middle schools, and the top three performances will then perform their routine at a location (date/location to be determined) before spring break of the 2014/2015 school year. Contact our Public Education Coordinator, Tony Rodkey, via email at arodkey@countrysidefire.com or at (847) 367-5511, if you should need further details on the contest. Good luck everyone!